Yes, indeed, PPBF is back! And I’m very excited today to be featuring a book that is so new it was only released THREE DAYS AGO! Not only that, but you can read an interview with the illustrator, Debbie Ridpath Ohi, on Joanna Marple’s blog, AND Debbie herself will be doing a guest post on my blog on Monday, September 10th (complete with GIVEAWAY)! Now, to the book, and a perfect picture book it is. EDITED TO ADD: Debbie has just sent some sample spreads to enhance this post. Thank you, Debbie! Note: These are used by permission and are not to be copied. Thanks. Opening Sentences: I’m bored. Bored. Blaaaaaaaaaaaaaaaaah. I’m so BORED! 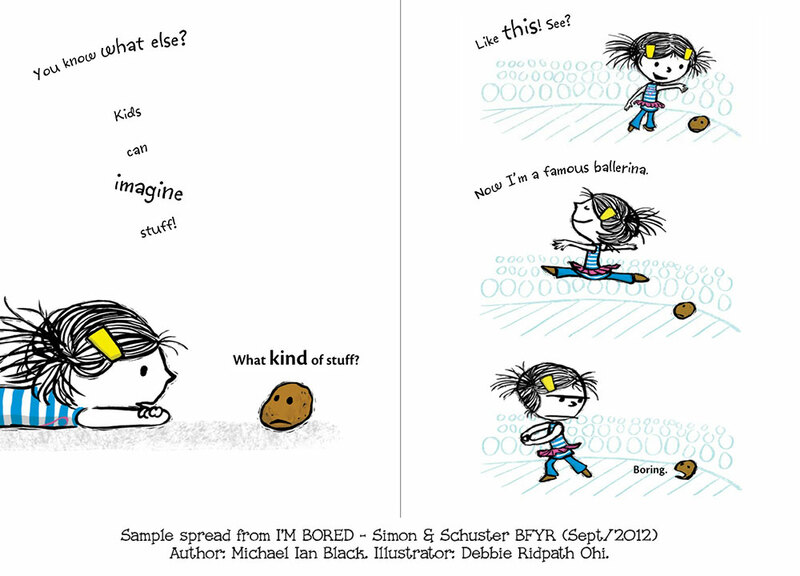 With few words, the author gets into the mind of a child (and a potato) perfectly. This is a laugh-out-loud book, and an identify-with-thoroughly book. Debbie’s illustrations are key to the humor of the book. 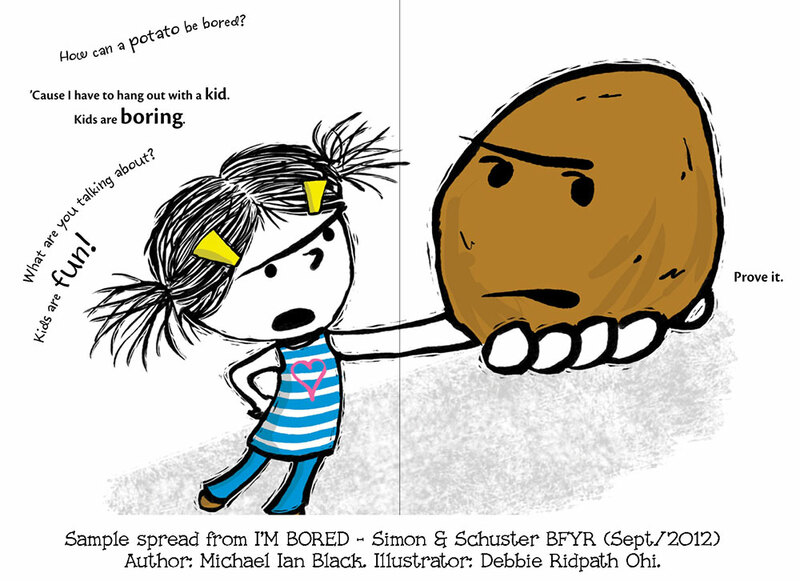 With a few simple lines she captures the total ennui of the child – and the potato. As the child’s imagination soars, the backgrounds show what is happening in her imaginative play, and there are funny details that one catches the second, and third, and fourth time one reads the book. (Yes, it’s a “read this one again” book.) I particularly like the fact that the illustrations give kids ideas for their own imaginative play – a cardboard box on the sofa becomes a pirate ship; toilet paper makes a great streaming veil on the top of a cone-shaped construction-paper Guinevere hat; the tube from inside paper towels is perfect for fighting off dragons. This is the illustrator’s first picture book – I predict great things from Debbie Ridpath Ohi. Activities/Resources: The illustrations themselves are great springboards to imaginative play, showing all kinds of ways kids could dress up and pretend. Debbie has lots of activities on her website as well. There are facts about potatoes – Did you know that the first food grown in outer space was a potato? Nothing boring about that! There are potato-related activities – books to read, science related project suggestions, and an illustration of how to make a potato stamp (the stamp-designs-on-things type stamp, not the mail-a-letter type stamp). There are coloring pages and write-your-own-story pages. 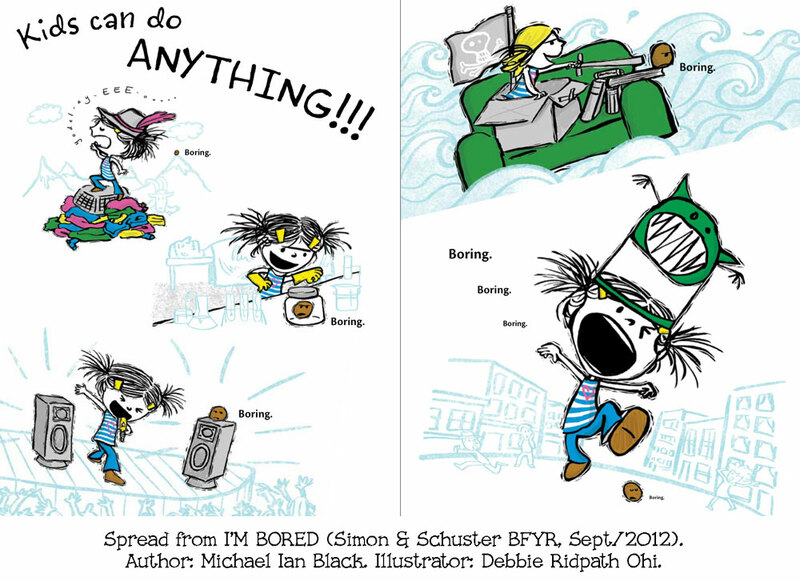 And all kinds of other things are available as well on the I’m Bored BONUS PAGE. You may never be bored again. Availability: Readily available (hot off the press) in hardcover. Check out the music video trailer! aaargh, because of my nomadic lifestyle at the moment I have yet to put my greedy paws on this book. I am so happy for all the publicity it is getting. This is a cool review, Beth, and I am so following Debbie around some blogs in the hope of winning my own copy (for when I have somewhere to live!). Heh…thanks, Joanna! And thanks for interviewing me!! I really need to get this book. I have been impressed by everything I have read about it and about Debbie! Thanks for a great review, Beth. Seriously, a potato? I have got to read this book. That is BRILLIANT! Thanks for the review! Great choice for PPBF, Beth. I have been following Debbie too on Twitter and so love hearing about this book. I love her illustration style, need to get myself to a bookstore to check this wonderful book out. Looking forward to Monday now! Yay, Julie, thank you. 🙂 And yay for Beth for being kind enough to let me share with you! Looks fab! Congrats to Debbie. This is a great first book Debbie. The story is so relevant. And the illustrations are captivating. Loved the video as it added another dimension. Eager to read it! No surprise as to the the first selection on PPBF being from you Beth! Having used your teeth to open the package delivered directly to your house (nice idea to fool us with the photo of the scissors), the moment it was released, well…!!! lol. And I am not surprised that the potato was the first food grown in outer space: it was also the first plant I grew in a dark cupboard, which, when closed, looked just like outer space minus the growing-stars! So great to be back curiously hunting perfect PB reviews on Fridays! And I’m pretty honored to be chosen as a PPBF by Beth. Love the added spreads. I just crack up at that potato saying ‘boring’ all the time. This looks hysterical. Although I’ll have to enjoy it myself (without my kids!) My 3 & 2 year old have not discovered the meaning of the word ‘bored’ yet, and I’d like to keep it that way for the time being! Love, love, love this book! I just got word from the LA County Library system that they are ordering it for their collection. I am so excited! Wow, this book is so cute! I love that the potato thinks that kids are boring. A+ for concept! Great choice for PPBF, Beth! I think that’s one of the best set of activity pages I’ve seen for a picture book-well done! The potato gets me and I will be buying this book, it’s at the top of my list. Thanks for sharing it, Beth, and I look forward to reading the interview. I can’t wait to buy my copy too! I’m stuck in the house studying. My lit sessions start soon and I plan on sharing this! Great review, Beth! Much Success, Debbie! Great review, Beth. Can’t wait to read it! Love the book cover and pics, love the trailer and I love potatoes anyway they come. (funny, I mentioned a website for kids making potato stamp wrapping paper on my blog..lol). Thanks for the kind words. 🙂 And I love potatoes, too…even more after working on I’m Bored! Heh. This book looks like so much fun! I love the expressions of the little girl and the potato. What a fun and unique way to inspire a child’s imagination! I read the post earlier on Friday. Excited to return and see the spreads. My copy of the book is on its way. I can’t wait. Yay, thanks so much for ordering the book, Stacy! Beth…what a wonderful choice for the first PPBF of the new season! 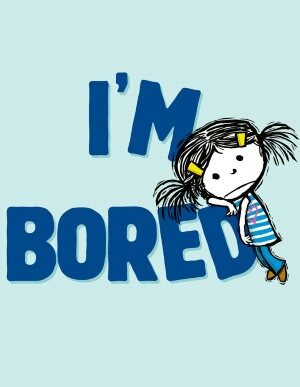 How many times did I hear my kids say, “I’m bored”? Actually, not too many because they knew my answer would be that I would give them something to do…like folding laundry or sweeping the floor. 🙂 The book will definitely be a hit with kids AND adults…and the illustrations are INCREDIBLE! Wow, thanks for the very kind words, Vivian! Much appreciated. Oh wow! This looks hilarious. Thanks for sharing.